. 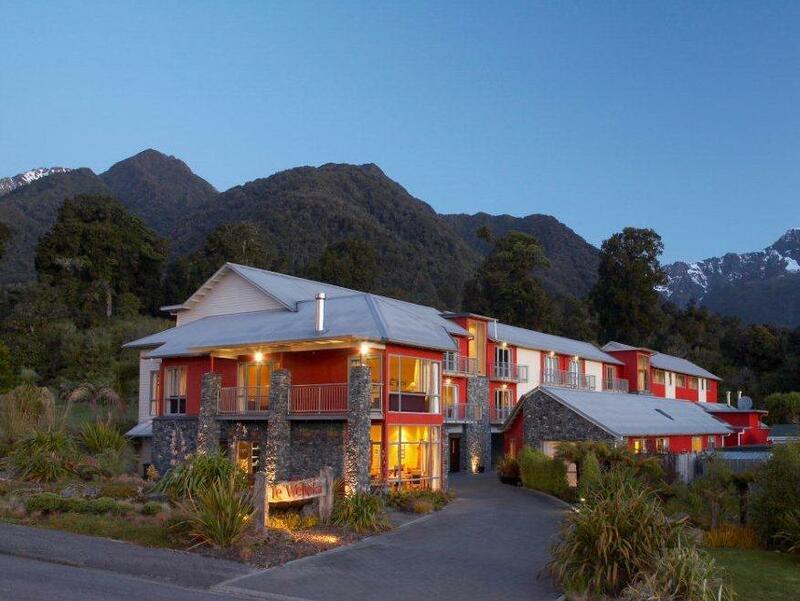 إن Distinction Fox Glacier Hotel حريص على توفير الراحة للنزلاء، فلا يوفر الموظفون جهداً في تقديم أفضل الخدمات وضمان حسن الاستقبال. تتضمن الميزات الرئيسية في هذا الفندق: مرافق مخصصة لذوي الاحتياجات الخاصة, واي فاي في المناطق العامة, صف السيارات, مطعم, خدمة غسيل الملابس. تنعكس أجواء Distinction Fox Glacier Hotel في غرف الضيوف.تلفزيون بشاشة مسطحة, غرف لغير المدخنين, تدفئة, مكتب, شرفة/ تراس هي بعض الميزات الموجود في العديد من الغرف. كما أن مجموعة الخدمات الواسعة الموجودة في الفندق لضمان راحتك تترك لك الكثير من الخيارات لقضاء وقتك أثناء فترة إقامتك. مهما كانت أسبابك لزيارة فوكس جلاسيير، فإن Distinction Fox Glacier Hotel هو الخيار الأفضل لإقامة مثيرة وممتعة. The service wis lovely and our booking comes with a buffet continental breakfast as well as a warm American breakfast. The room is a bit tight but very comfortable. There is aan elevator serving all floors but teh hallways are tight. All the rooms are named after the explores to the region or the pioneers. That is a wonderful touch. The Fox Glacier township is less busy than the Franz Josef township but it is far cozied. The Fox Glacier trails were all closed and closed indefinitely unfortunately. The hotel is very quiet and clean. Check in is easy, breakfast is great. The location is great, can easity get to several beautiful sites, including the Fox Glacier. Very comfortable overnight stay, handy for walking to the town for evening meal etc. Very good stay in Distinction hotel. Good breakfast and walking distance to any shop/activity (the town is small anyway). We went there in Spring so the hotel was not full which was very good! I guess you need to book VERY early in Summer. The manager was talking about people booking 1.5 year in advance, crazy! Definitely one of the best hotel in Fox Glacier! Stayed for a 2 night stay and loved this hotel. Good sized room with great views. Walking distance to town centre and restaurants. Extremely helpful Scottish staff lady who gave us loads of travel tips- both locally and around the West Coast. Would def return here again. High quality finish, especially the bathrooms, nice communal lounge, $15 for unlimited wifi (first 50Mb free) was great, and the $2 laundry (+$2 dryer) with free detergent is a very nice touch for those looking to travel light. distinction hotel was more like a b & b with hosted drinks with the manager each evening in the lounge. lounge area on 1st level was comfortable area to relax & read with gas fire and internet area, and reading material. free wi fi should have been available without charge the rooms were tastfully decorated, spacious, modern with comfortable bed, bath robes and excellent bathroom with full size bath and separate shower, and good quality shower gel, shampoo and conditioner. plunger coffee available in rooms at no extra charge. breakfast was included in the tariff with good continental selection, cold cuts and a couple of hot selections from the bain marie. We arrived on a rainy day and were treated to some 'Scottish' hospitallity by the manager both professionally and personally. Cannot speak highly enough of her and her staff. Well done. Ich hatte gedacht, bei dem hohen Preis ein gutes Hotel zu brkommen. Es ist aber nir ein überteuertes Motel - alles leicht dreckig, keinerlei besondere Austattung. Mit Boutique Hotel hat es meiner Ansicht nach auch gar nichts zu tun! Nur von aussen sieht es gut aus - schöne Mogelpackung.